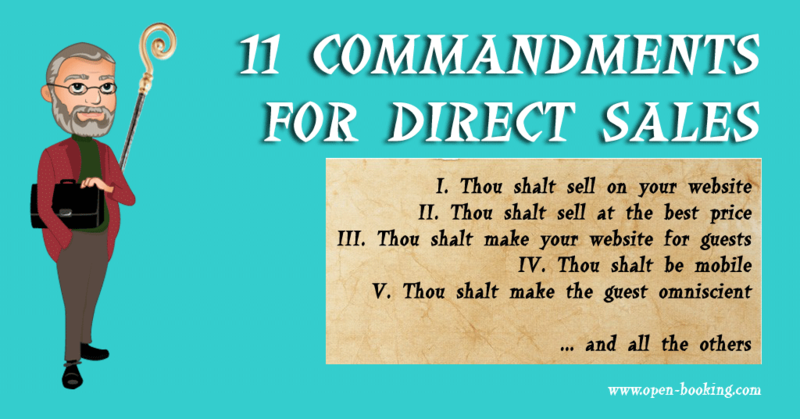 You are asking how to come to direct bookings – here are the 11 Commandments you should follow. No rule is given by god – just given by experience. Use this clear laws for your website. This way vacation rentals, hotels or other businesses in hospitality can recover the own sales force and become independent of external distribution channels. Your website is not a business card but your sales channel. No matter what strategy you go to attract visitors for your business: Your website is there to sell (or at least to generate the leads for your sales team). You need the best converting booking technology for your website and show it on popular positions. It should be easy to use for the guest (collecting as few data as possible, not more than 3 clicks, and popular payment options). Good booking technology enables beside the direct booking also the booking of additional services, booking of packages and campaigns promo codes. Take care for processes: even if the guest will not realize if everything works well, he will for sure have unwanted feelings, if something will not work according his expectations. Take care that nobody offers a better price for your product as you show on your website! They might have the same price, but never ever having something better. Distribution partners like listing-sites, OTAs or Voucher sellers try to be cheapest. It is their main argument for distribution. Travel clubs work with discounts to attract members. If people can book the same product cheaper elsewhere, there is no occasion to book direct with you. Why should you give your strongest argument away? If there are the same prices you can “paint” your product with a little bit of color: Include a small gift, an additional service or provide better booking / cancellation policy for direct bookings. Take care, that this “package” is only available for direct bookings on yours website. Be interested in your customer. Your website shall solve their actual problem (of decision for the next short term rental). Stop to describe your product, show a value for the guest. The value can be to buy/rent a benefit, an emotion or a solution. Your guest will not be interested if there is a terrace but if he can make a barbecue outside in the evening. A pool is cool, if the kids are allowed and secure to play on a hot afternoon until sun goes down. Three sleeps are cool, if snoring Grandpa Joe is sleeping far away. If you don’t know your guest, work with “Personas” and describe the individual and unique solutions/emotions/benefits. There is no excuse if your website is not mobile friendly. Research and booking on mobile devices is sky-rocking. If people cannot book with you on their mobiles, they cannot book with you. Take care, that all your form and technology is tender for the way of surfing of your future guest. Show your website visitors, that they will learn more on your website then on a OTAs website: Have more and better photos, be more individual and specific in your content, have most actual prices and vacancies as well as provide own customer reviews and testimonials. Be affectionate with the details that make your vacation rental brand. A child-friendly house has not only a high chair but also cutlery and crockery for babies – a nice photo opportunity. Your customer orientation is also reflected in the quality of content: Professional photos show your personality / Brand: You want to make it to the guest obviously beautiful. Let the user compare prices on your page: If you use distribution partners, tell about them and show their prices – as you have the best product for the best price only on your website. Make direct booking a win-win situation for you and your guest. Hotels often use gifts, freebies, vouchers, upgrades or loyalty points. It can also be non-financial add-ons: An invitation to your Friday evenings barbecue or the excursion to join activity on the best surfing spot in area or a “hello beer” in your local restaurant. Check the personas and choose individual incentives. Best incentives do not work, if they are not promoted popular on your website. Trust is obtained by professional design and photos, authenticity in your actions and reviews / recommendations. Do not try to be something you’re not. Use web design, photos and videos as optical proves for your other proposals of value. Let your former Guest speak for you with reviews and recommendations on your own website. Ask them to give honest reviews and publish prominent on the website. You have nothing to hide. No matter where you found your website visitors – if they come from a search engine, advertising or the word of mouth or any other referral – you have to catch the interest and hold them on your website. The first view will make the decision to stay on page – impress visually with emotional pictures. Every little problem can cause a bounce. Be user friendly and perfect in every little signal you give to your audience. Every minute more will raise your chance for the booking. Do never offer to leave the page! Offer communication on your website wherever you can. A first tool is your “online concierge” – a Live Chat. Your audience will have questions and you can guess about these questions while following them walking on your website. You even can trigger them to a talk. Just do not stalk them. For the majority is email the main communication channel. Publish your email-address prominent and answer fast. Use communication to make your presentation better. Questions will tell you about missing value. Create additional personas after your talks and adjust the promised solutions. Use all relations you get through your website and booking tools to create long lasting relations. Care for your audience, care about your guests. Use personal information to send birthday cards, send out regular newsletters and stay in touch through social media. You’ll gain returning visitors, guests and ambassadors for your business. Never give away control about your main sales channel and the communication. Do not redirect your booking requests, your phone-calls or e-mails to a third party. If you are hiring freelancer for single jobs, take care whom their loyalty belongs to. Give no way, never ever, at no time a chance to kick you out your direct bookings! Whenever you come into the temptation to break one of the commandments or you do not find the way – use the Open-Booking Team! Use the chat, send an e-mail, and call us. We will help you to resist evil! And give us your comment for other commandments. « Please Let Them Book Direct!